Thinking of making the switch to Proposify? We want to make the decision as easy as possible, so we've put together some info that'll help you decide which option is best for you. Below, you'll find information to help you compare Proposify and Bidsketch, including features and customer experiences who have made the switch. Bidsketch is great if all you need is a basic WYSIWYG editor for you proposals, but Proposify looks and feels more like a true document editor. We are dedicated to making the best proposal software for digital agencies and freelancers, or anyone else who highly values design and doesn't want to appear cookie-cutter. 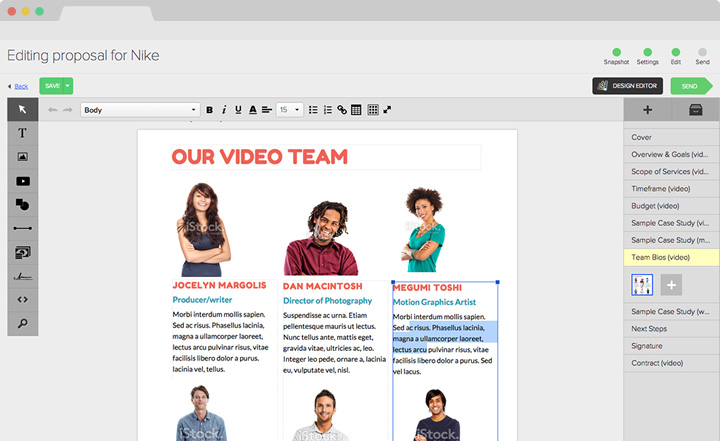 With Proposify you can create text boxes on the page, flow text between pages just by hitting the enter/return key, and drag and resize images, shapes and lines. You can even move them to the background, just like in Photoshop. You can also choose between over 600 fonts, unlike the 5 you get with Bidsketch. Unlike Bidsketch, Proposify lets you import as many of our pre-written templates into your account as you'd like. Take the whole library! Bidsketch enforces a structure for your proposals, whereas Proposify will let you place your fees page in any order, whether you want it on the first page or the last page. You are in control. Bidsketch doesn't offer much when it comes to reporting and metrics. With Proposify you get a complete breakdown of which sections your customer looked at, for how long, when they opened it, how many times, and how long it took them to open it. You get notified as soon as your client opens your proposal and get averages across all your proposals which you can filter by date range. 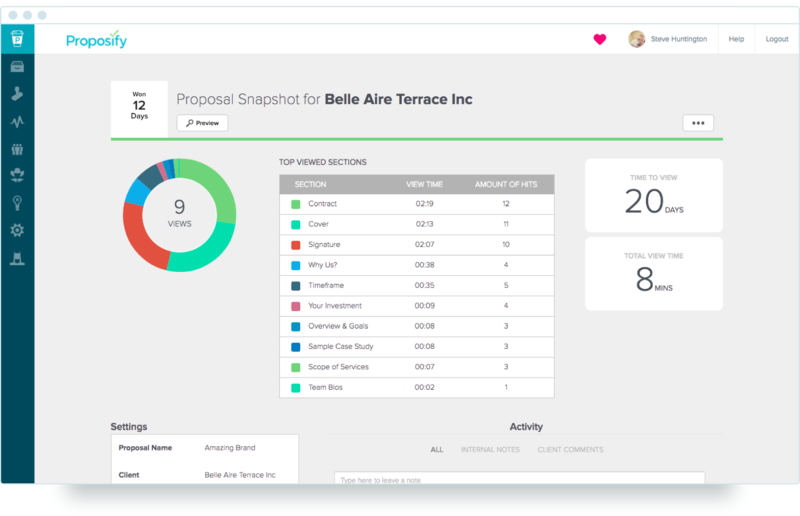 We also give you a complete breakdown of how many proposals you sent, are viewed, were accepted or declined along with their dollar value, what your close rate is, and let you select a date range so you can compare whether or not you're getting better or worse over time. Ready to give Proposify a try? We hope this comparison guide was useful to you. Making the switch is easy; you can get your whole team set up on Proposify in just a few minutes. Still have questions? Just click that chat widget in the bottom right-hand corner of this screen. We hope to see you in Proposify.